Have you been to England? Do you wish you could walk the paths your forefathers walked over 400 years ago. 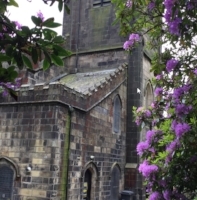 This summer, my sister, Shawnee Fairbanks Korff, took a trip to West Riding, Yorkshire, and Lancashire, England to visit our families’ home lands. She toured the towns of Halifax, Sowerby, Warley, and Luddenden of the Calderdale Valley in Yorkshire. Then she toured Bolton near Wigan and Shevington in Lancashire. Taking pictures of historic buildings and places of the 17th century, she brought her trip to us. Luddenden is a small town a steep walk five miles from Sowerby. Shawnee says Luddenden and this path reflects the charm and flavor of the othersmall towns in the Calderdale Valley. Sowerby, pronounced “Sore bee” in England, is the town of our forefathers. They lived there before leaving for New England. It was a hamlet built on the side of the steep Pennine mountains with the Calder River rushing below. Just across the valley is Warley, where Mary Gawkroger-Platts lived before marrying John Prescott. You can see the buildings of one town across the valley from the other. They look near, but the elevations of the hills make it a long walk to get from one town to the other. “Your feet slide down into the very toes of your shoes when you are walking downhill through the ancient rock walls that border all the paths,” Shawnee says. The pastures in this area were once covered with rocks. The resourceful Yorkshire men used the rocks to build the fences that separated their land from those around them. Even the young boys had to learn to repair a stone fence: a yearly task. 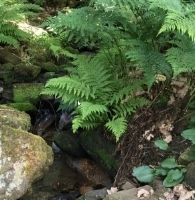 Streams begin high in the scenic Pennines, not from springs, but from the snows and rains in the mountains. The clouds are forced to give up their wet cargo as they sail up and over the elevations from west to east. Water flows freely, babbling over stones down the hills to the Calder River. The early folk used the water to wash and process the wool they wove into Kersey cloth, a thick cloth suitable for coats and horse blankets. Every homeowner was his own master. The families bought wool, spun and wove it into cloth. Then they sold it at the wool halls. uniform is a good example. In June, the wild rhododendron bushes and ferns cover the ground. Moss coats the ancient stones. It is a great time to venture where our Fairbanks and Prescott relatives lived and walked about 400 years ago.